Using your roof as a deck is often the only way to utilize the unused space, or to create a private outdoor experience in the urban setting. Homeowners can go onto their roof deck, start a grill and invite some friends for beers or a cocktails. 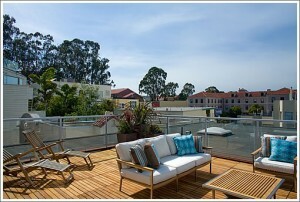 A roof deck can also be a quiet and private retreat, without having to drive anywhere. However, if a roof deck is not properly waterproofed, it can be a source of leaks and headaches. To have a truly enjoyable experience and many years of leak-free service from your roof deck, it is important to choose your deck material wisely. One of the best choices for flat roof decks is PVC roofing material, which is proven to be completely watertight, durable and long-lasting. Roof decks are typically constructed so that a layer of waterproofing material is sandwiched between the roof substrate and a floating deck on top. While PVC material is excellent for flat and low-slope roofing application, it can also be used as an excellent waterproofing material for maximum protection against leaks. This is not a typical use for PVC material, which is why many homeowners and builders are not aware it, typically choosing inferior waterproofing options. Most of the time, a builder or contractor will opt for the first thing that comes to mind, as a waterproofing choice – EPDM rubber roof. The problem with using rubber roof material is that it relies on glue to remain watertight, and glue will break down after a number of years, requiring a complete disassembly of the floating deck, repair to the rubber, and then rebuilding the deck on top. PVC roofing is ideal for solving this annoying problem. All seams on a PVC are heat-welded, and do not break down with time. Thus, it is much easier to make the roof deck completely watertight, before placing a floating deck on lop of it. When using PVC material for deck waterproofing, the membrane is laid out over insulation or any separation layer, and can be either mechanically attached or fully adhered to the substrate. When mechanically attaching the membrane, it is essential to position ALL fasteners in such a way that the deck slippers would not rub against them. A contractor should map out the location of all slippers prior to attaching the insulation and roofing material, and then place all screws and plates between the slippers. With 16″ OC placement, this is not difficult to accomplish. After installing the membrane, all penetrations and roof to wall joints should be flashed by heat-welding the flashing around posts and along the walls. Should you build a floating deck? Consider IB DeckSheild instead. In addition to the traditional floating deck assembly, PVC can be also used as a walkable surface for roof decks. There are specialty products created by PVC makers that have a slip-resistant surface, combined with beautiful design, to make the construction of an outdoor roof deck easier and MUCH less expensive. One example of such product is IB DeckSheild roof deck membrane. IB DeckShield as a 60-mil PVC membrane that is installed in a similar way to a fully-adhered PVC roof. However, because people will be waling on it, a special substrate – DensDeck is added under the sheet of membrane, for support and rigidity. DensDeck is fully adhered to the insulation or the roof substrate, with a two-part adhesive (spray foam), and rolled in with a heavy water-filled or steel rollers. Once set in place, the seams are filled in with seam compound to make transitions smooth, and then DeckShield is glued over DensDeck. When the entire membrane is laid out, the seams get heat-welded. This essentially completes the PVC membrane installation. If there are any penetrations on the roof, special color – matching pre-formed flashings are welded in to create a seamless, yet water-tight appearance. Alternatively, you can install IB DeckShield, which will cost around $3000. As you can see, the overall cost of installing just the waterproofing material is the highest for DeckShield. But when you add the cost of building a deck on top of the roof which is necessary for a rubber or a typical PVC roof, DeckShield comes in about $2000 less. If you still prefer the traditional wooden deck, it is advisable to choose a slightly more expensive PVC roof over rubber, as the few hundred dollars that you save on installation, will not be enough to cover deck disassembly and roof repair costs down the road, when a rubber roof begins to leak. 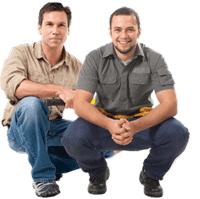 For more information on PVC installation prices, check our guide here. I am in the Hilton Head, SC area. Do you know of anyone in my area that can install a PVC deck. I now have a SealOFlex deck that is deteriorating and needs replacing.